It’s the most wonderful time of the year. So they say. But, the holidays can be stressful and overwhelming, to say the least. There’s so much to do, and it goes by so fast. Scott and I celebrate Christmas and Hannukah, along with several birthdays, during the month of December. That makes the holiday season even more overwhelming. And expensive, I might add. I hate to miss out on any of the good stuff (especially the real meaning of Christmas), but by the time I get everything off of my list, Christmas is practically over. The holiday season is a time to reflect on God’s gift to us. JESUS! And yet, I’ll be the first to admit how easy it is to forget the real meaning and all the blessings behind it all. During the past several years, I’ve come to learn a few tips that not only helped save me time and money, but also helped me to have a more joyful Holiday. These tips work well for me. So, I’m pretty sure they’ll work for you, too. Simply upload a photo from the past six months into one of these on-line sites and customize your card in record time! * Here are my favorite websites for making cards: Shutterfly, Tiny Prints. * Or, if you prefer paperless, try: Paperless Post. * It may sound like a lot, but for approximately $150, you can have one of these websites ADDRESS and MAIL OUT your cards, to all of your recipients. All you need to do is enter in the names and addresses on a downloadable spreadsheet (one time, and update it each year). If you consider the cost of cards, stamps, and whatever that sacred Saturday afternoon is worth to you, it may be worth the cost! * SHOP AT HOME! Why spend all that time dealing with crowds and driving around for the best deals? Make a list of your recipients along with 2-3 possible gift ideas for each. (If you need help with my ideas, check out my Gift Guides!) Try to group the gifts into categories (i.e. Clothes, Toys, Electronics). Perform a google search for each item. Click on the shopping tab to find the best deal. (Keeping any promos or coupons in mind.) And don’t settle for anything less than free shipping. It’s almost ALWAYS available this time of year! * KEEP WRAPPING SIMPLE Use Bags & Tissue. Skip the Bow. Grab boxes from Department Stores. Or hit up the dollar store! Barnes & Noble Free year-round. During the holidays, nonprofit groups do the wrapping and donations are encouraged. Online purchases can be gift-wrapped for $3.99 per item. Bed Bath & Beyond Free use of a do-it-yourself wrapping station stocked with all the supplies. Gift-wrapping service for online purchases is $2.99. Lands’ End Gift-wrapping is available only for phone and online orders, and it costs $6. But unlike many merchants, Lands’ End will pack multiple items in the same box at your request. L.L.Bean Free during the holiday season at the flagship store in Freeport, Maine. L’Occitane en Provence Free in store and online. Gift-wrapping materials include paper, cardboard, and wood from sustainably managed forests. Lord & Taylor No in-store wrapping, but the pretty gold and silver boxes are free. Nordstrom Ask your sales associate, and he or she will usually wrap your purchase free. If you shop online, you can buy a gift-box kit for $2 that includes a box, tissue paper, bow, and gift tag. Origins Free in store and online. You get a sturdy, colorful box and pick the color of the ribbon. Gift sets have fancier wrapping. Pottery Barn Free in store starting in mid-November. Raymond Jewelers Free year-round. This family-owned business has just one retail store, in Wethersfield, Conn. If you buy online, you can request a free gift-wrapping kit that includes a box, your choice of wrapping paper, and a matching bow. Engraving and shipping are also free. Tiffany & Co. Year-round, all in-store and online purchases are lavishly wrapped in tissue, placed in a signature Tiffany blue box, and tied with white ribbon (or red ribbon for the holidays). A personalized gift card is included. Von Maur Free year-round. This family-owned chain of 27 department stores, primarily in the Midwest, offers free gift-wrapping and shipping. At its website, vonmaur.com,you can choose your wrapping paper and personalize a gift message. * Consider using Butcher Paper in White or Brown as Gift Wrap…really for ANY occasion. Not only is this paper good to have on hand for gift wrap, it makes a GREAT coloring canvas for the kids. Butcher Paper Gift Wrap with a Simple embellishment such as a red doily, pine cones, ribbon, or just string! 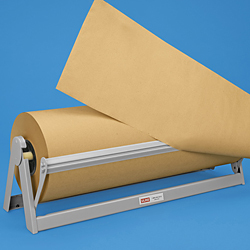 You can buy this butcher paper relatively CHEAP at Amazon! While you’re at it, consider splurging on this paper holder and cutter. Something you will have FOREVER! *Use Ribbon & a Simple Accent Over Store Bought Bows – If you haven’t joined Joann’s Email List, click here to sign up for offers to save 20-30% off ANY ITEM, such as this beautiful ribbon priced now for $2.99/yard (before coupon). *Be kind to yourself. Keep it Simple. Candles in the windows ($2.99 for the Sensor ones that turn on by themselves at dusk. This Pre-lit Garland is GREAT for Mantles, Staircases, and Door Entryways. * Decorate SIMPLE on the Outside, too. This picture, below, shows my favorite outdoor look for a home. It’s classy and simple. Plus, it is a time and money saver. So long as you have windows, just add wreaths with bows along with that candle in each window, and a bright flood light to make everything stand out at night. The best part of this look is that you can even appreciate the decor in the daytime, as the wreaths and bows really stand out. By the way, it’s not that hard to install a wreath on each window. (Trust me, The House on High Street has over 40 windows!) You can do it from inside, so long as the top part of your window opens. All you need is ribbon, a small piece of wood, and a stapler. The House on High Street ~ Simply adorned with wreaths and red ribbon. Wrap ribbon around the wreath, and staple to a block of wood. Open the top portion of your window, and after lowering the wreath down, close the window between the ribbon and the wood. * First off, I do most of my baking or decorating on Black Friday. I REFUSE to go out in the madness of crowds. I shop from home! * Arrange a Cookie Swap. Only bake one or two kinds of cookies. Then, ask a few friends to swap with you. My staples are Italian Biscotti (these freeze great) and Rachel Maria’s EXTRAordinary cookies. My EXTRAordinary cookies are so easy that you can let the kids make them! Not to mention, you can make them in a pinch when unexpected visitors stop by. * Cook Casseroles leading up to the holiday season, make large quantities, and freeze half. (i.e. Soups, Stews, Marinara Sauce, Lasagna, Stromboli) Check out my Recipes Here. *If you bake early, like I suggested, you will always have cookies on hand. *Keep wine, beer, eggnog, coffee and cream, etc. stocked. *Keep cheese, crackers, frozen french bread, Olive Oil, Chocolates, Nuts, and/or Fruit on hand. *Keep simple menus in mind that are easy to throw together for a Holiday dinner or an impromptu cocktail party. * Have your Dining Table Ready at all Times with a pretty table cloth and center piece. Hopefully, you can use one or many of these ideas to save some time, money, and energy this holiday season. Remember, the most important thing is to enjoy it! God deserves our attention during this time. Jesus is the reason for the season. We have so much to be thankful for. And so, my prayer for you is that you and your family will have a blessed holiday season!